This entry was posted in Uncategorized and tagged season's greetings on December 17, 2013 by alwrites. What makes a Gloucestershire copywriter? Hot on the heels of my last post about CV writing, I took a trip down my own career memory lane when former boss, Martin Clarke OBE, got in touch for a chat about some writing support. As well as his briefing, our conversation was a great opportunity to revisit old times – and to remember former colleagues who are no longer with us. Martin is one of those super-influential people that everyone should meet during their career (another is Mike Rigby, from whom I learned so much about PR writing at MRA before going freelance). Now the chief executive of the British Precast Concrete Federation (the recent OBE was a well-deserved reward for services to the concrete industry), Martin was the group marketing manager at ARC (later part of the Hanson plc empire) when we worked together in the 1980s. Reminiscing over coffee reminded me about the importance of the diverse experience we gather throughout a career. From childhood, I was always interested in graphics and writing, yet, by twists of fate and circumstance, my CV shows 15 years of selling, market research report writing, marketing management and technical writing before I launched my own business as one of the copywriters in Cheltenham. Sometimes during that time I felt I wasn’t on the right course, but with time and focus on what I really wanted to do, I moved myself into the place I’m meant to be – and where, I believe, I was always meant to be. So what about those years in quarries, selling mortar to hard-nosed contracts managers, or estimating for a packaging operation (alongside the PR writing), or managing promotional projects for Bradstone Garden Products? Looking back at my CV, and the years of experience it represents, I can now see with startling clarity the value of all those experiences. And so, I believe, do my clients. You see, I’m not some Johnny (or Jilly) come lately aspiring copywriter fresh out of college with their shiny English degree. I’ve been round the block a few times, and the quarry, and the packaging works, and the aerospace tech pubs department and the PR agency, and it all adds up to what makes me, well, ‘me’. Add a bit of innate writing ability, some creativity and a lot of writing practice to those experiences and you have a unique resource: someone who really understands industry and business and marketing; someone who’s been where you are and stood in your shoes. Someone who can convert what you do into a meaningful story for your chosen audience. Yes, sometimes it’s good to look back and reflect on what shaped the person you are now. And why certain things happened (or why you made them happen). Then you look to the future and apply everything you’ve learned to the next copywriting project. 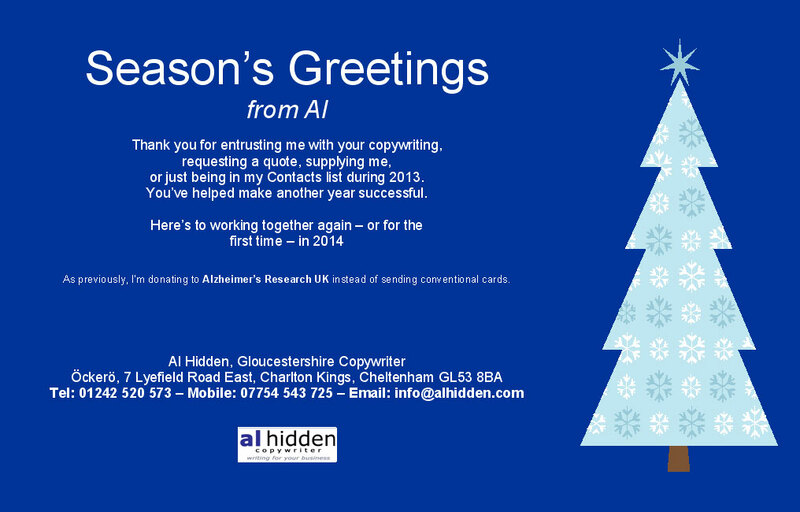 This entry was posted in Copywriting ideas and tagged cheltenham copywriter, gloucestershire copywriter on December 14, 2013 by alwrites. I had the opportunity to deploy my military CV writing service for a client recently. I’m not one of the mass-CV generators; there are plenty of people offering this service. What I offer is a bespoke service for anyone who wants the attention to detail, fact-finding and writing that a professional copywriter can offer – especially if it’s a military to civilian CV, with all the special challenges this brings. My most recent client, approaching the end of their military career, fell into this category and presented all the challenges of military CV writing: the requirement to demilitarise terminology; the need to turn military experience and achievements into benefits that will appeal to civilian employers; and the usual CV presentation challenges. At least there was plenty of great material to work with; members of the armed forces come with amazingly varied experience, loads of training and a wealth of skills that should set civilian employers’ mouths watering. 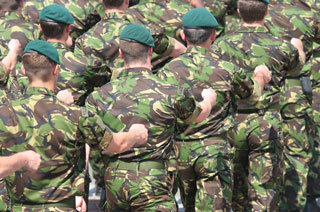 It’s well known that, once the transition to a less rigidly structured civilian working environment is managed effectively, ex-military personnel have loads to offer in business or administration – particularly in areas such as transport, logistics, risk management, training and project management. The final document was a concise, well-structured CV that put the emphasis in all the right places, sold the candidate strongly and, importantly, allowed scope for the person involved to tailor certain sections to specific vacancies in future. That’s important for any candidate: because every vacancy is different and every CV must be tailored. As a CV writer and editor, building-in this capability is an important part of the document design and writing role. With so many military personnel coming out of the forces, there’s a great opportunity for civilian employers to access this pool of skills and experience. And for the CV writers, like me, who specialise in military-to-civilian-transition-CV writing and editing. What’s more, while using many of the same skills, it makes a refreshing change from my usual website, brochure and client case study writing. This entry was posted in Copywriting Skills, Uncategorized and tagged cheltenham copywriter, client case study writing, cv, cv writer and editor, cv writers, cv writing, document design, gloucestershire copywriter, military cv, military cv writing, military cv writing service, military cvs, military to civilian transition cv, professional copywriter on December 6, 2013 by alwrites.